If you're looking for healthy lemon bars to include in your weight-loss diet, there's a good chance you'll like the brand I buy. They're the naturally flavored baked lemon bars sold by Fiber One. These bars are low calorie and delicious. Fiber One's lemon bars are not homemade, of course, but at just 90 calories and 3g of fat each they won't bust your diet, either. Each bar is about 2 inches square and individually packaged. They get great reviews (see below), so you don't have to take my word for it. These healthy lemon bars have just enough sweetness to satisfy a sugar craving. They have a great lemony flavor that tastes natural and isn't overpowering. Being ready-made means I can grab one anytime. I like them cold, so I usually keep them in the fridge, but that's not required. These lemon bars are the perfect size to take along when traveling or anytime you're away from home. For most of my meals I mostly eat all-natural foods, especially those from the 15 Fat Burning Foods list. I rarely go for starchy or sugary snacks or desserts, except as an occasional treat. But once in awhile I get a craving for sweets, and one of these healthy lemon bars usually leaves me satisfied. If you're like many who are trying to eat more fiber, you'll be interested to know every bar contains 5g of healthy fiber. They also have 8g of sugar, which isn't terrible as long as you eat just one! That's where willpower comes in handy. 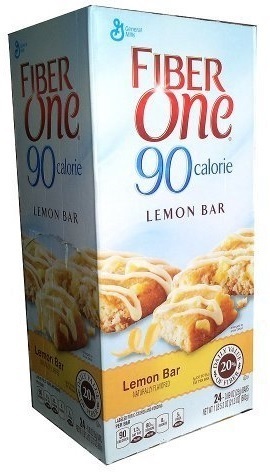 Fiber One lemon bars can be found at many groceries, including online. I usually buy mine at Costco, but they're also available at Walmart and Amazon.com . These are my favorites. 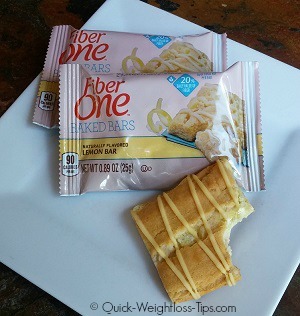 (Verified Purchase) "These lemon bars from Fiber One are delicious. I hate to say that this came to me as a surprise. I'm one of those people who are so shocked when I find something that is good for you is also great to eat. I love these." You feel like you're cheating - but you're not. (Verified Purchase) "If you are watching your weight, like me, this lemon bar is a welcome treat. You are adding fiber, which is very healthy for us. They are only 90 calories and best of all, they taste great. They don't stop my weight loss and that is a requirement." Tasty, lemony, sweet, soft and cake-like; not too sweet or too tart. Deeelicious. (Verified Purchase) "Soft, cake-like, sweet and lemony. The best lemon bars I've bought in a while, and they are 90 calories with fiber. No way you can lose with these." Reach for this instead of cake or weird-tasting fiber snacks. (Verified Purchase) "Delicious - lemony and doesn't taste like fiber. The fiber is effective without unpleasantness. Satisfies the cravings for cake, too." The positive reviews go on and on like that. Pretty impressive. Do you have food allergies? Be aware these healthy lemon bars do contain wheat, milk, egg, and soy; and may also contain peanut products. These bars do not contain tree nuts. That's good for those (like me) who are allergic to nuts. Sticking to a diet can be tough when you're trying to lose weight. Sometimes it feels like you have to give up all your favorite treats. But in the case of Fiber One's healthy lemon bars, you can have your cake and eat it too. Give them a try! If you like these lemon bars, or even if you prefer a different brand of store-bought bars, feel free to tell us about it in the Comments section below.